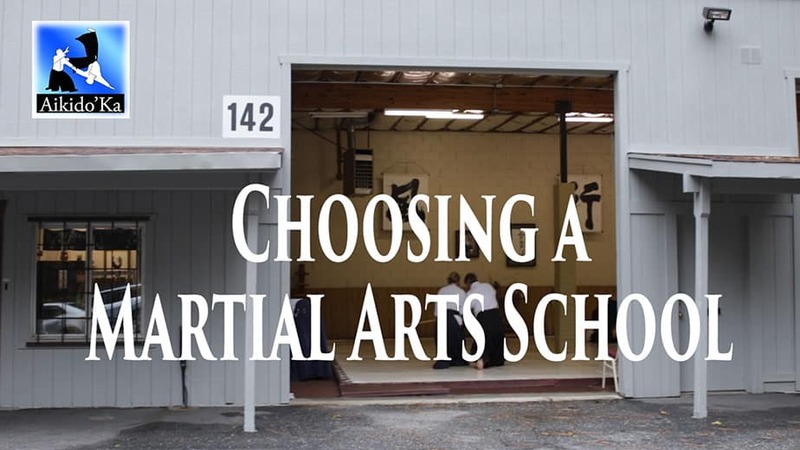 I am putting together a series of posts and brief videos about how to choose a martial arts school for you and your family. Here’s Part 1: The People. In martial arts training, particularly aikido, you’re going to be spending lots amount of time with the students and instructors at your dojo. So, choose the dojo — and the people — wisely! To me, people are the most important part of training. If you don’t want to spend time with the instructors and the other students, then it makes no sense to join that martial arts school. It doesn’t make any difference what their martial arts style is. If you don’t like the people, move on. So, start and end your research with the people who you’ll be training with. Aikido, along with every other martial arts practice, is done with a teacher. If you think that you can learn aikido online, or from a book, you are fooling yourself. You can’t. Find the right teacher and you’ll learn. In fact, find the right teacher and you’ll love your martial arts training! It doesn’t matter what level black belt the instructor is or how many competitions that person may have won. None of that guarantees that the instructor is any good or is the right instructor for you. Start your research by learning how much the instructor cares about your practice. As Chief Instructor at Aikido’Ka, I care about why you want to practice martial arts. I will work to help you understand and achieve your goals. I meet with every single prospective aikido student. I personally do every orientation. We will discuss why you want to train and how our community may help you reach those goals. I will then formally meet with you, quarterly, to make sure you are getting what you need from your training. All of the instructors at Aikido’Ka are happy to speak with you, any time, about your training. Make sure that the instructors, and any staff, are courteous and professional. Make sure you feel safe and that your child will feel safe. I can’t imagine a worse situation than joining a martial arts school to build your confidence and character and being frightened the entire time you are training. Please don’t do that to yourself! Ask the instructor about his or her larger training community. Is the dojo an active part of an organization or the school isolated and on its own? Aikido’Ka is a member of the California Aikido Association, which, despite its name, has member dojos around the world. We are members of the 2nd division, which is headed by Michael Friedl Shihan. Friedl Sensei is an absolutely great guy and has been my personal aikido teacher for years. Aikido’Ka is very active in the CAA. I do not exaggerate when I tell you that I have friends many places around the world thanks to being an active member of our extended aikido family. Don’t just look at the instructors. Talk to the students. Does the dojo have any people who have been training for more than just a short time? Are there people at the dojo who have been training for 10, 20, or 30+ years? If so, you can figure that people like training there. Do people have fun when training? Do they feel safe? Don’t only ask the students. Watch them train and see if they look like they’re having fun and feeling safe. Here’s what I’d like you to do: Come to Aikido’Ka. Sit and watch. Join in. See how people interact with each other. Look at their faces. See if they’re smiling and laughing and making friends. You’ll see that Aikido’Ka is a fun, friendly, safe atmosphere. It’s a good, safe place to be. Feel free to talk with any of the students at Aikido’Ka. We don’t have secrets. Ask them anything them about their training. They’ll answer you truthfully. Many martial arts schools will give you one free class to figure out whether their place is right for you. They will then want you to sign up and start paying dues. I am quite sure that one or two classes is not at long enough for you to learn all you want about the teachers, the students, and everything else. At Aikido’Ka, we want to make sure that you choose the best martial arts school for you. So, you receive 30 days free to try out aikido training. That’s right, you have a full 30 days to see if the instructors, the students and everything else works for you. If not, then it costs you nothing. You don’t have to buy a uniform or anything else. Your first 30 days are free. Now I’m not saying that you can’t join us in that first 30 days, but you don’t have to. And those first 30 days – they’ll be free. 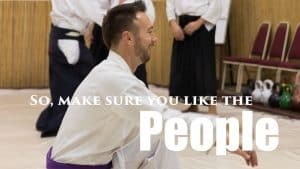 So if you’re looking to improve your health, your life, your confidence, build some self-defense skills, and all sorts of other positive things, then please start your free 30 days at Aikido’Ka right away. You’ll know if we’re the right dojo for you. Just call me at (530) 273-2727, or send me an email and we’ll get you started. I look forward to training with you! Start your 30 days free training now by filling out the form below.